How things can change: “We used to get a patch of sun on the floor in the back room for about half and hour in the morning, and another half an hour in the front bedroom in the afternoon.” The addition of a high-level, double-glazed north-facing window brings in light and opens for natural ventilation too. Standing in his kitchen speaking to me about the impressive transformation of his century-old terrace into an efficient, modern 6.2 Star home is about the last thing Ben ever thought he’d be doing. “I normally abort any conversation about home renovating,” he laughs, only half joking. Talking about your ‘home reno’ especially when you live in Melbourne’s inner north can quickly veer into the political. Northcote, where Ben’s been living in the same house with his partner Sarah for almost two decades, is experiencing an unprecedented period of gentrification. In every street, houses are being tarted up and redeveloped and concerns about affordability have contributed to the area becoming a marginal seat in recent state and federal elections. “We’re getting increased house sizes in the area, but not increased density. More density is what we desperately need – not larger houses with pools,” he says. Ben and Sarah recognise that everyone’s a participant in this wave of change, and are trying to make theirs a positive contribution. 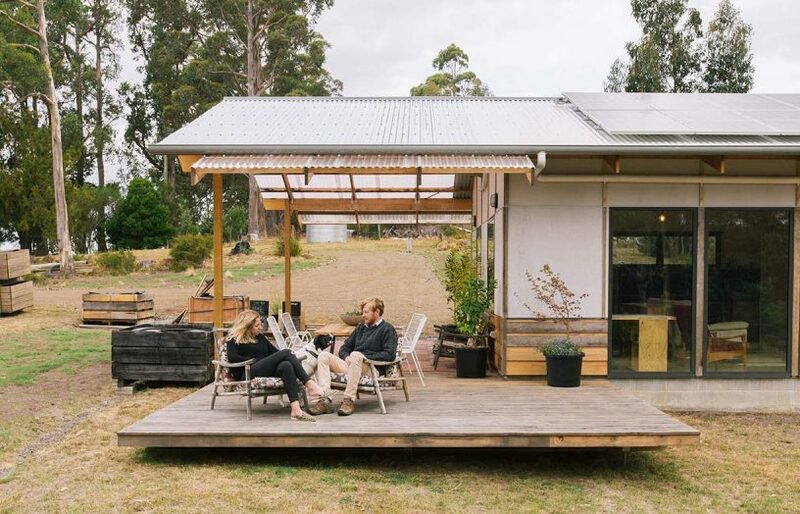 They don’t own a car, and over the years added water tanks and solar panels to the house. In his work as a public health advocate, Ben’s been a persistent voice calling for safe, walkable cities and active transport options for people living beyond the inner ring of suburbs, which already have great amenity. If they were going to renovate, they decided to “do it once and properly,” which for them meant respecting the neighbourhood character and undertaking a complete building upgrade which could sustain the house for the next 100 years, and them for the rest of their lives. But there were some pretty major site constraints to contend with: the narrow block is just six metres wide, there’s a party wall along the north boundary that restricts solar access from that direction, and an uninspired 1970s laundry lean-to on the back blocked access to the tiny rear garden they wanted to protect. 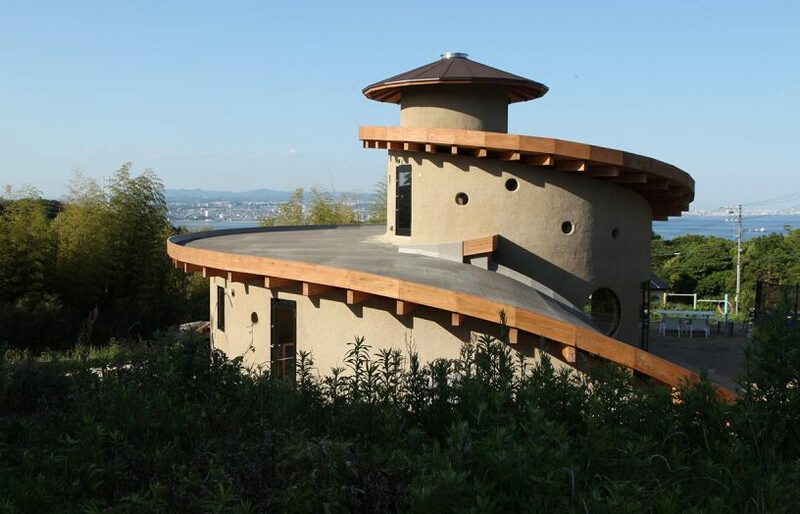 They also didn’t want to increase the built footprint. 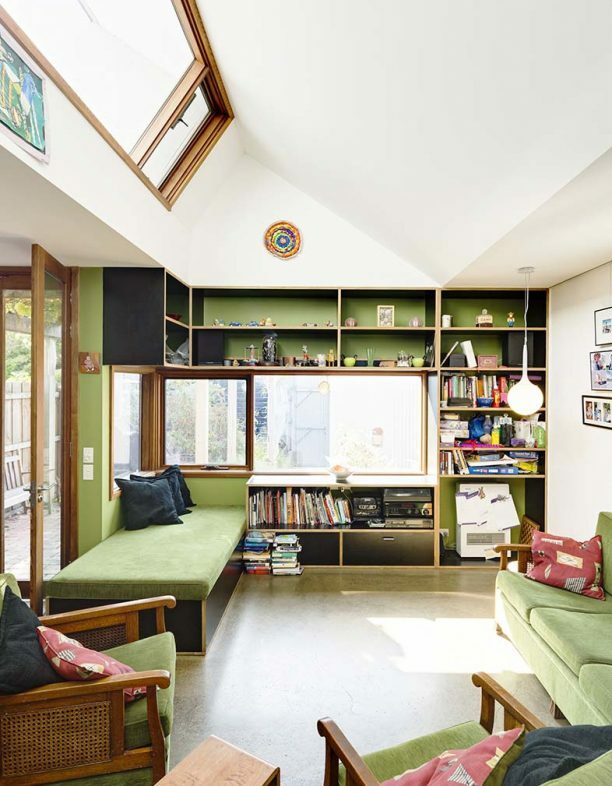 (Image 1) “We didn’t go for bifold doors because we wanted insect screens, but this area is still really connected to the house,” says Ben of the living room windows. Grapevines provide summer shade; the timber cladding has been allowed to weather naturally. 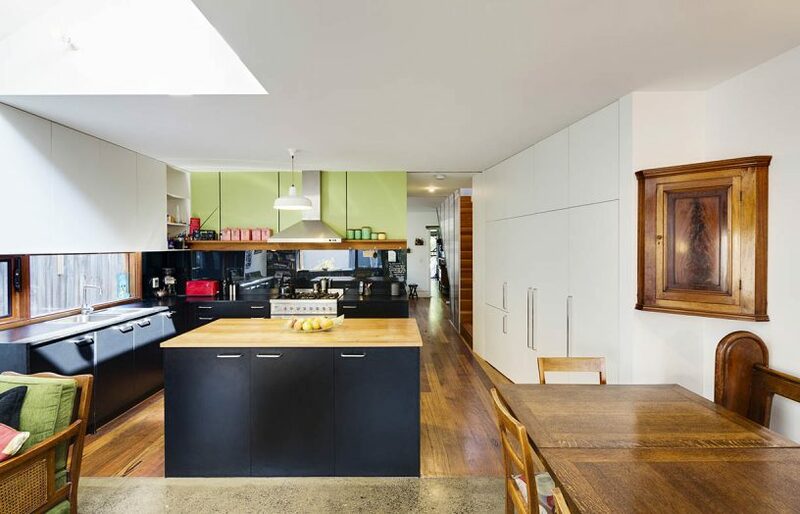 (Image 2) Timber from a salvaged church pew is now a benchtop; the bulk of the kitchen is made from FotoPly and Paperock. The ceiling is lower above the kitchen due to the addition of the second storey. (Image 3) Their budget wouldn’t stretch to include a glass balustrade, so instead they’ve used sheets of polycarbonate, with glass beads sandwiched between. “That was a lot of fun and it’s something that the clients could be involved in,” says Ande. 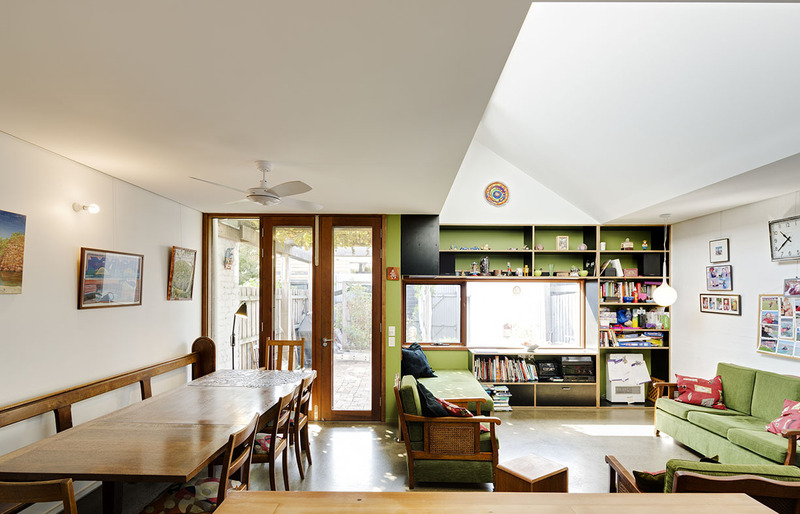 Adding another room was going to open a Pandora’s box of challenges for such a hemmed-in site, so they engaged architect Ande Bunbury, whom a friend recommended for her expertise in energy efficiency. With nowhere to go but up, Ande introduced a modest second level that’s set back from the street and, to keep a low roof profile, the ceiling heights of the two-storey section were reduced to avoid overlooking the neighbours. 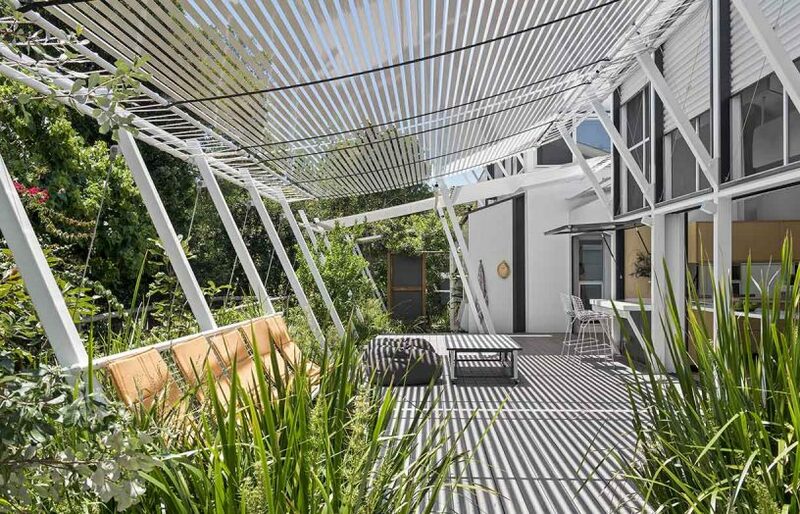 “A skillion roof meant we could get light down into the back living area and create a roof deck, which has become another outdoor area,” says Ande. 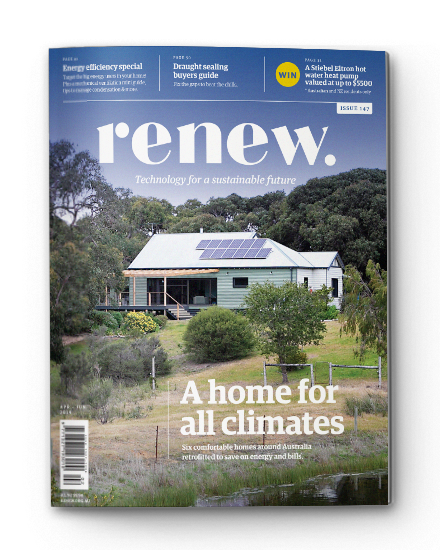 Sarah and Ben had already insulated the front of the house and double-glazed when they’d replaced the weatherboards a few years earlier, and decided to keep the front two rooms and entry hall intact. But the rest of the house was completely rebuilt to a reconfigured floor plan. 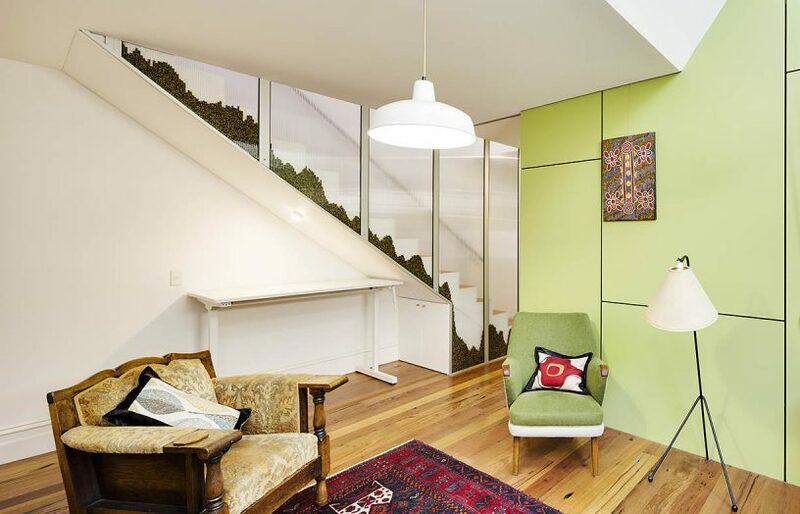 The house retained its central lounge room, but Ande made it work harder by including a kids’ study nook under the stairs and clothes drying racks that hoist up into a double-height lightwell. Relocating a now combined laundry and bathroom to the middle of the house allowed for a larger kitchen and family area that could be connected with their productive garden. Because they wanted an energy efficient home, Ben and Sarah wanted to avoid installing air conditioning and central heating. 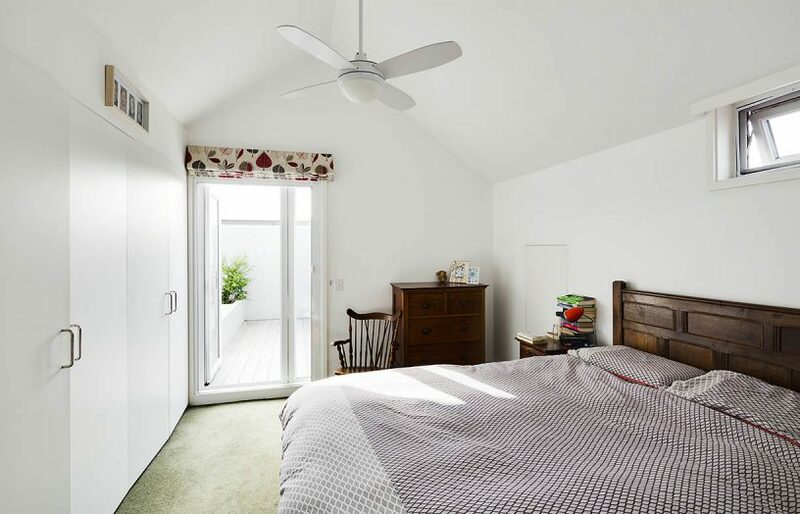 Instead, they have invested in ceiling fans, gap sealing, double-glazing and thermal mass in the form of a concrete floor downstairs and phase-change material upstairs. “For period houses like this there’s quite a bit of work done by the builders to take the doors off and square them up and add seals along the bottom and around the edges of the frame,” says Ande. “Simple – some might say basic and boring – things like this make a huge difference to how airtight a house is.” Internal doors allow the house to be zoned for thermal control and provide acoustic privacy between rooms. 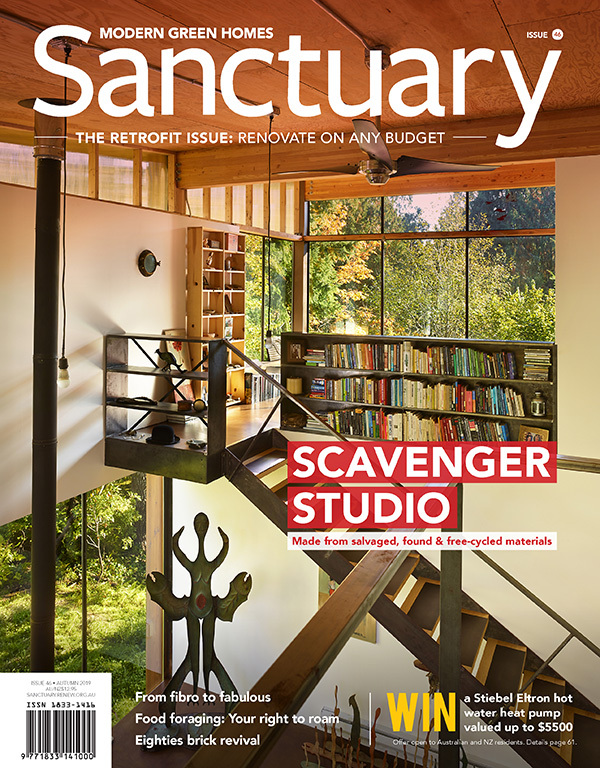 The upstairs bedroom opens onto a north-facing roof deck of durable composite boards; clerestory windows permit winter sun to warm the concrete floor in the living space below. Roman blinds set tight against the doorframe are important for energy efficiency. 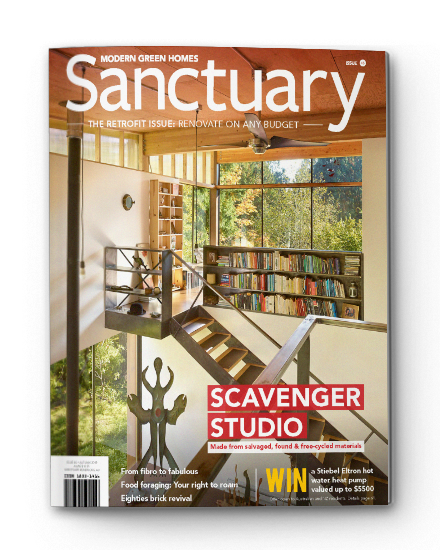 The upstairs study borrows natural light from the south-facing skylights above the central lounge room, giving the effect of a lightbox. 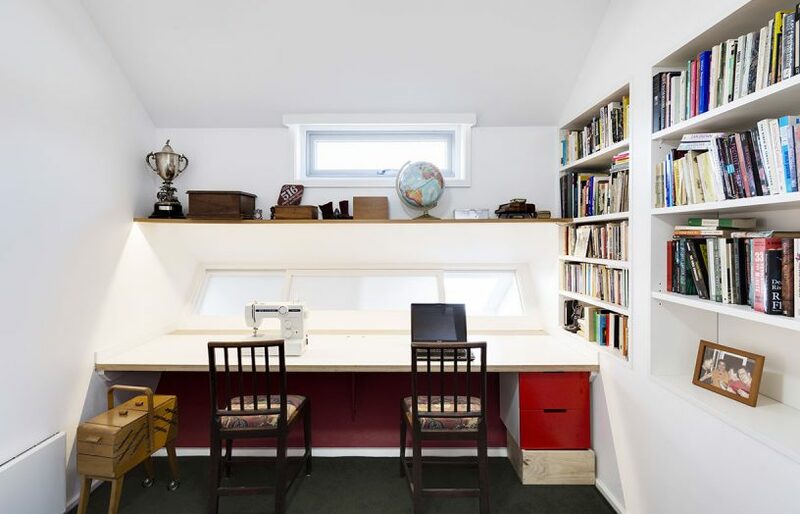 Storage is tucked in everywhere, including behind the bookcase where there’s a discreet attic. There weren’t many fixtures worth keeping from the original house, “just the stove and a toilet roll holder,” says Ben. But they retrieved some significant furniture – an old church pew and a large timber desk – from long-term storage which they’ve used sparingly to personalise the interior, with great effect. 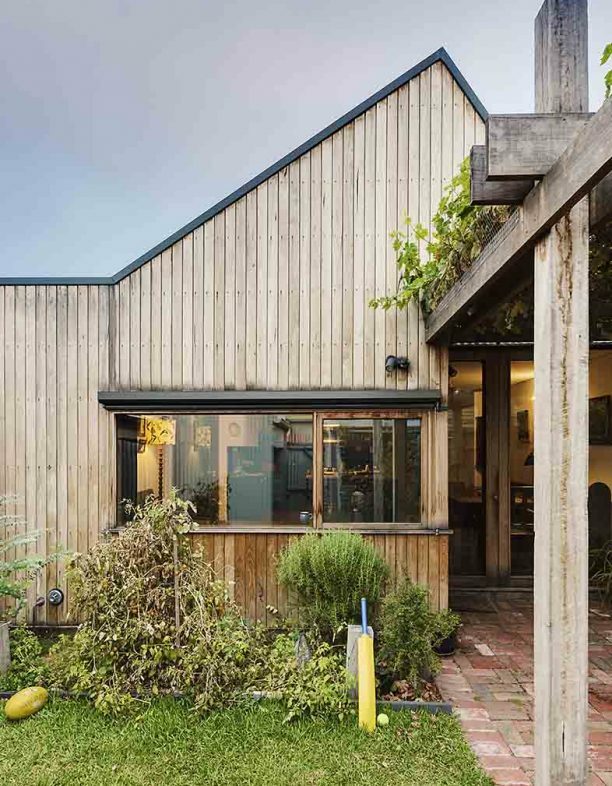 Instead of a rear carpark – normally desirable in areas with limited street parking – there’s a human-scale back gate off the laneway and small garden shed with dedicated bike parking. “I miss having a workshop, but there was just not enough space for that plus the patch of grass, which the kids use all the time,” says Ben.